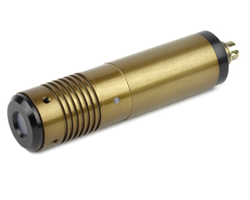 The Lyte-MV is a laser diode module emitting a uniform (non-Gaussian) and well-defined line with a user-adjustable focus. Its ability to evenly illuminate objects across along the entire length of the line allows the Lyte-MV to be used successfully with industrial CCD and CMOS cameras in inspection, measurement, and control systems. Recommended for industrial environments and demanding applications, the Lyte-MV is vibration tested between 10-500 Hz and temperature-cycled between -20°C to +50°C. It also conforms to European EMC standards EN61000-6-4 and EN61000-6-2. Wavelengths of violet (405nm), blue (450nm), green (520nm), red (635, 650, 670, 685nm), and infrared (785, 808, 850, 980nm) are available with output powers up to 200mW. Custom power and wavelength combinations are also available. Please contact us for a custom solution not mentioned in the product documentation. A comprehensive range of accessories including mounting clamps and rail systems, mains power supplies and laser safety and enhancement glasses are also available to complement the Lyte-MV.